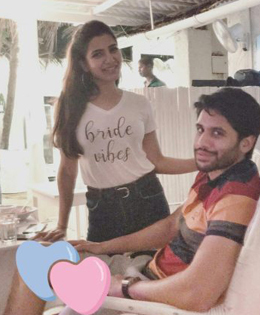 Actors Samantha Ruth Prabhu and Naga Chaitanya are all set to get married today and both of their fans are excited. Their love story is literally like a movie! Congratulatory wishes have been pouring in n social media for the couple. Turns out, their muhurtham for the traditional wedding is 11;52 pm! The celebrations will begin with Mehendi from 3pm – 6pm followed by Dinner at 8;30 pm.Post that, the actual fun begins as Samantha and Naga Chaitanya get ready to be married to each other AT 11;52pm! Day 2 will begin with brunch between 12pm – 3pm followed by the Catholic ceremony at 5;30 pm. Post which, everyone will cut loose and partay! The wedding will be intimate with only 150 guests invited for the 2 day gala. The ceremonies will be followed by a grand reception in Hyderabad where the who’s who of the industry will be part of the event. Samantha and Naga Chaitanya have personally looked into the accommodation and airfare of each guest. Naga Chaitanya's father Nagarjuna Akkineni recently told that the guest list has some 100 names on it. "With Rama Naidu garu's (Naga Chaitanya's maternal grandfather) and our family, it's hardly 100 members. It's not a lavish wedding, it is the most simple one." A Times Of India report added that the 'simple wedding' may cost Rs. 10 crore. Naga Chaitanya and Samantha Ruth Prabhu are busy actors. They've taken time out for their wedding but their honeymoon will have to wait till the end of the year. Samantha told Mumbai Mirror: "We will fly out of the country for Christmas and New Year's Eve. We don't have the time now." Naga Chaitanya is the son of Nagarjuna Akkineni and his first wife Lakshmi Daggubati (daughter of Rama Naidu). Akhil Akkineni (born to Nagarjuna and his second wife Amala) is Naga Chaitanya's half-sibling. Unlike Naga Chaitanya, Samantha doesn't have film stars in her family tree.